Look at Mountmellick – no such luck! Stacks of 5 each color Mini Dresden! Stitch each Plate at the top. 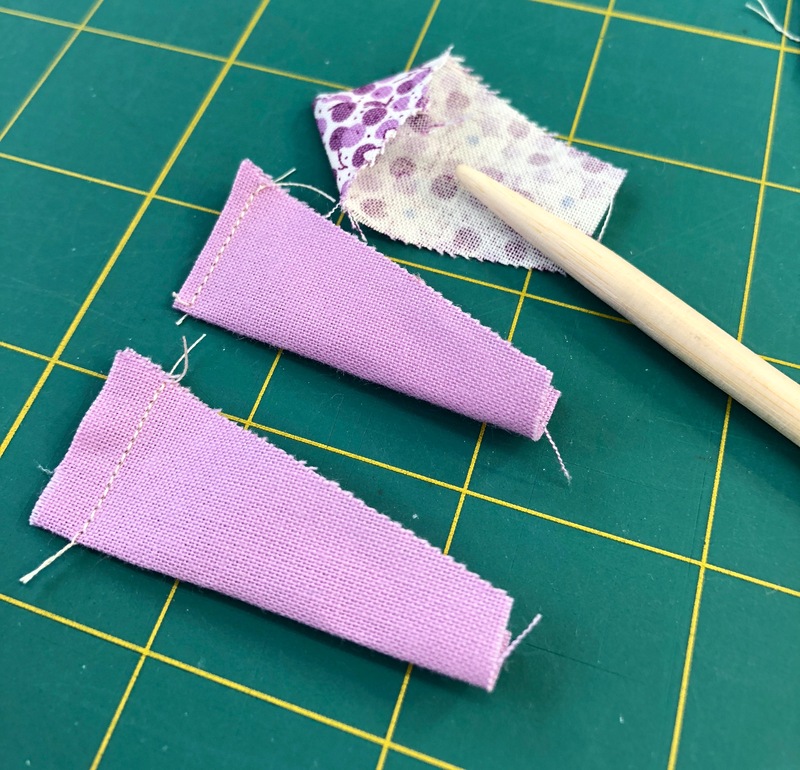 Trim each plate and using a wooden stick that came with some polyester stuffing (curved at the end by Clay) open each one up and either finger press or iron each point. 14 Finished sometime in the last 10 days! Ready and Waiting for me to Stitch! The next 25 are waiting for me at the sewing machine! After completing them I will be down to 16 more to cut out, stitch, trim, turn, and then sew! The end is getting near! I was able to work on Stonefields and completed 3 more blocks of Segment 5. I have 2 more blocks to appliqué and I will be have way finished with Stonefields!!! Now to select my OMG for February – Maybe March will find me caught up! Have a great day sewing! This entry was posted in Quilting and tagged Dresden Heaven. Bookmark the permalink. ← Life Again! A 2018 Update! I am so glad that you shared a link for the those Dresdens…I was wondering how they were going to be used. My husband made some stuffing tools/pointers from regular wooden dowels…I wouldn’t want to be without them! 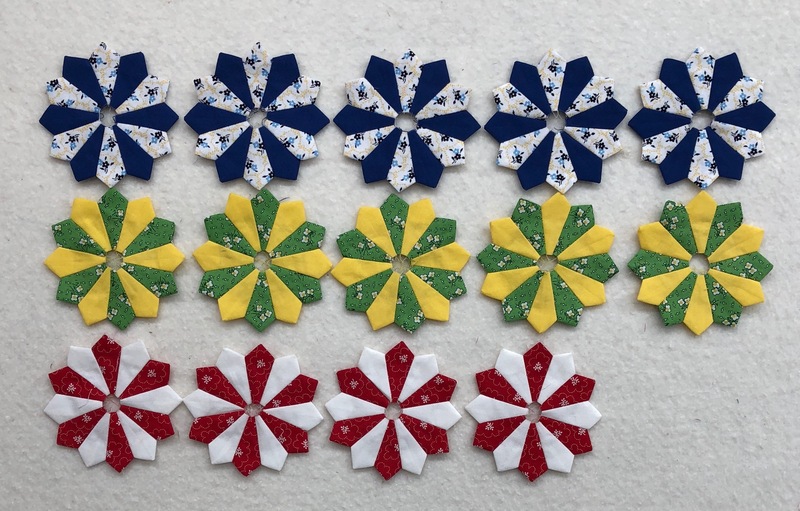 I am now thinking that I may just make the quilt full of Mini’s, but then her pattern is so dark, it took me some time to see how the larger ones could be ‘poppers’. Nice to have hubby’s that can do anything! Have a great day! Those Dresdens are so cute! This is going to be a lovely quilt. Stonefields looks great, next year I’ll start mine. I have the fabric for it. Thank you Gretchen. They are really fun to make. Stonefield’s is fun to do because you can work it in Segments. There are either 12 or 13 blocks in each segments – 121 Blocks total! I just love those dresdons! I am always a huge fan of them. They are so much fun and I now need to be ‘thinking’ of what color to use for the background… It cannot be white as I have used that in some of the plates….. Hum this may be a scrappy one! Thx for commenting and have a great day! love those mini Dresden’s! Wish i’d had a bunch made up, so I could hand applique them to their backgrounds on this unexpected trip. Mom-in-love not doing well, so we are driving down and will be gone a few weeks perhaps. Other family to visit too. His. When I purchased the pattern, Susan had the templates to go with it. I hesitated, but now am so happy that I purchased them – it is so easy and fast to cut the plates out. I have a couple of her patterns – not made yet… maybe later. Hand work is so great to take on the road. I never leave without something even if I do not get all completed that I had planned to. Why thank you Sandra. I made a Dresden Plate quilt long time ago, it nees to be quilted, but the plates were round! Makes me thing that I need to get that quilt top out and quilt it! Another one to add to the list of all. Have a great day and thx for commenting. I love how those little piles turn into such cute Dresdens! It took me a little while to realize that making these in groups and developing my process that it would really go faster and it does! I was lucky to find that little dowel in the polyester bag to get the point just right! Thx for commenting Gail and have a great day. I visited Susan’s page, and boy does she love her minis! 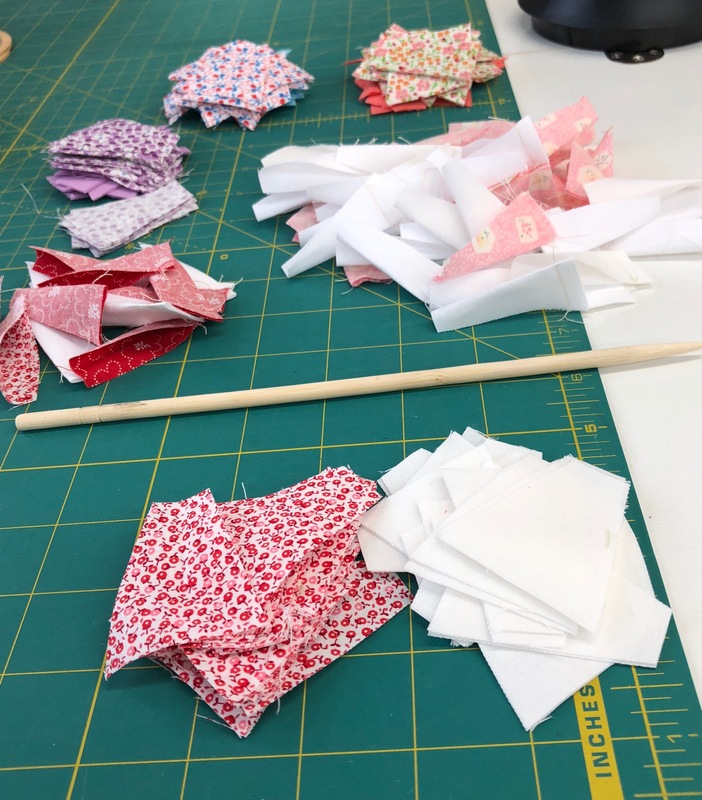 I think your fabric choice will make such a lovely quilt, so clean and crisp.😄 I am certain these minis speed up considerably when you do them in batches, but it would be a long day to only work on these! She makes strings and strings of them, my D1 does not do well with chain piecing with them very close together. It is the 1930’s fabric I bought to make the 1930 Farmer’s Wife. Never got there on that one. Yes they do when I work them in this technique and it took me most of Friday and Friday evening to turn 320 plates! Your Dresdens are adorable and I love your Stonefields. Why thank you! I want to finish Stonefields this year. I have so many quilts that I want to make! Wonderful work! It looks like you had a lot of fun working on it. 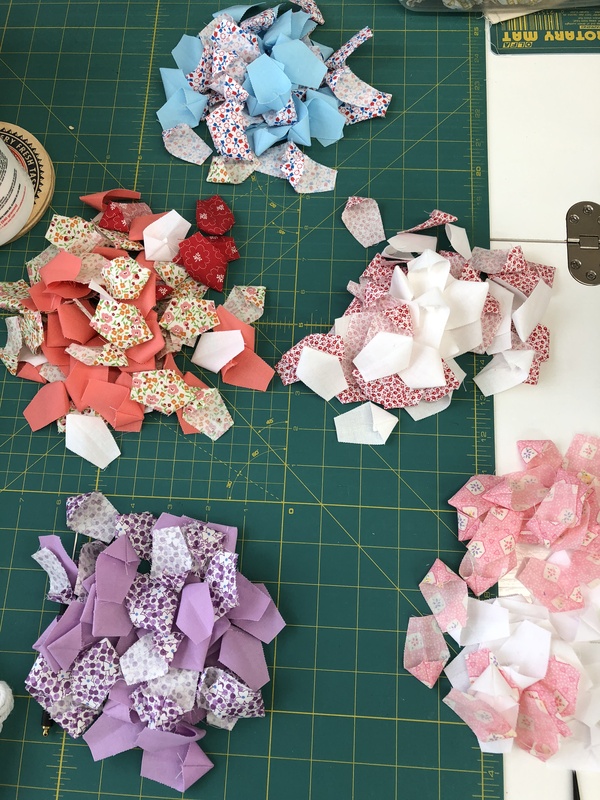 Those mini Dresden’s are a lot of work, but they will look fabulous on the finished quilt! Oh those dresdens are wonderful! Way to tackle them! Thank you Carla! Goal for the day is to finish this group – Have a great day and thx for commenting! Your Dresden Plates are so pretty. I hope you are busy sewing the rest. I really like those Stonefield blocks also. 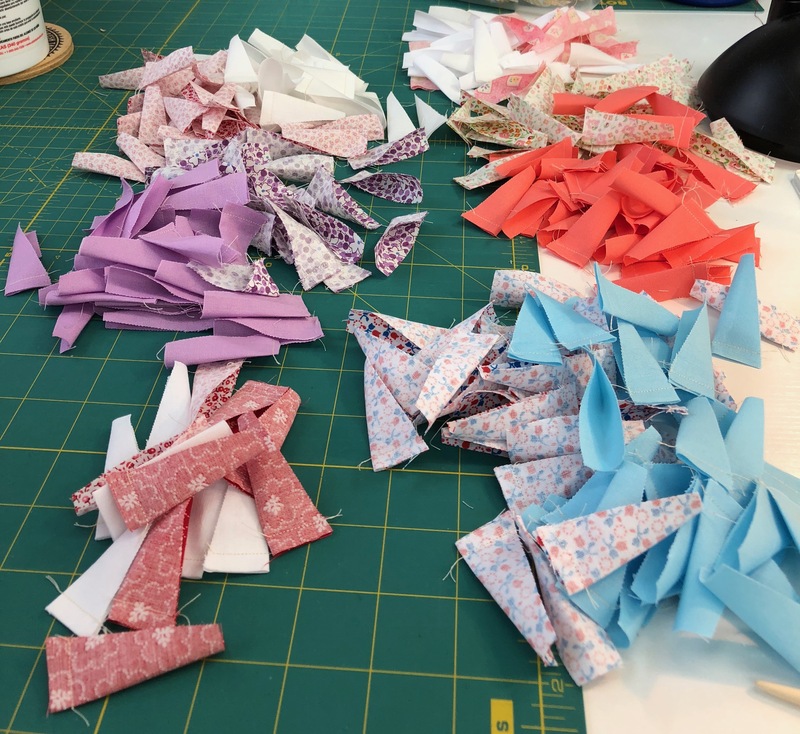 I have 15 finished from that group and 10 more today to finish – then there are 10 more to make and that will take a few days! Thank you Cathie for commenting. 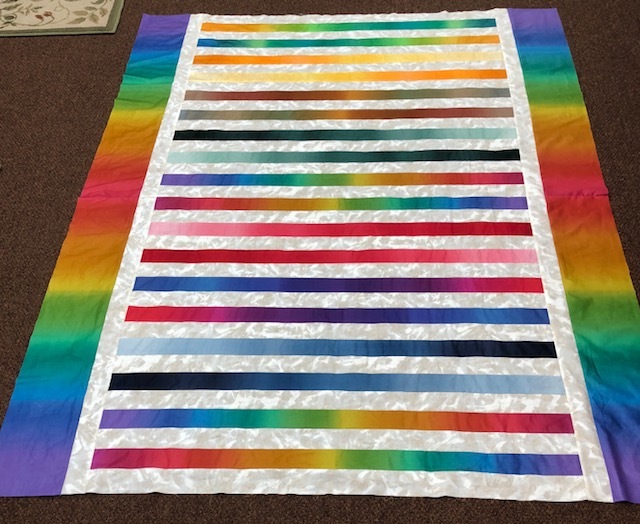 I really like how your colors flow on your rainbow regatta quilt. That Dresden quilt will be a masterpiece when you are done with it. Oh I hope so. Now to select a background fabric – I design like a quilt as you go quilter! LOL. Thx Janine for commenting! I love the dresdens, but don’t have the nerve to do. Oh Lori, they are so easy! You need to try them. I purchased her templates and they work so good with a rotary cutter, then you follow my technique and other than it can be time consuming, it is very easy. You could get addicted! That rainbow regatta quilt is rather stunning, so simple yet so effective. Thanks for linking to Sew, Stitch, Snap Share. Why Thank you Julie – I had fun working with the fabric and yet I was able to participate in the Block M. Have a great evening. Love your Regatta quilt, and the quilt for your new header!! I will be half way thru this quilt – I need to get with it – it is not a difficult pattern! Thx for commenting. I love your little piles of Dresden joy! Have fun! I just love those dresdans and they influenced my choice for my CQJP. And of course I love to see your Stonefields progress. Thank you Jocelyn. I am finally FINALLY back to where I am feeling great back into my walking and life and trying to catch up with projects. What is CQJP? Suz’n Quilts has some real cute patterns for those Dresdens. I just love those mini Dresdens. Thank you Cathy! Down to the last 16!